Hello i just got a tm fa-mas and im looking for some aftermarket bits. Also i would like any advice on upgrading the basic fps as its just below 300. Any help and advice will be greatly appreciated. The TM FA-MAS has a version one gearbox, with a very out dated motor which can only pull up to a M100 spring I believe? Ill be corrected im sure. Its difficult to modify them as the boxes have a lot of propitery [sp] parts, which leaves much to be desired. I'd say stick a 8.4V battery in it, maybe a longer tight bore barrel, leave the rest be. A lot of people praise the TM FA-MAS in a standard config. Done a lot of research myself. Thanks I got plan for new barrel the standard is it really 488mm lol. And do you recon the v1gearbox gears and cogs would cope with a newer motor. Its the prevailing consensus that you don't buy a TM if you want to fiddle with the component balance because the component balance is so fragile in them. I'd imagine that's particularly true of their older designs. Is there something WRONG with it? If it was any other brand i'm sure you'd get lots of people supporting upgrades, but TM have a rep for breaking quickly if 'upgraded', suffering worse performance, and decreased lifetime, not to mention being almost the only brand of gun from which people will accept a sub 95m/s on .2 out of the box. The TM Famas was TM's first true AEG with hop up. The V1 gearbox is probably the most rebust but it's held back as the motor is difficult to find and no one makes a spare. This limits you options for upgrades so it's best to look at other ways to get an FPS increase. The easiest way is to fit a tightbore barrel which should push the FPS up by around 10 to 20 FPS. Externally there are very few bits available. 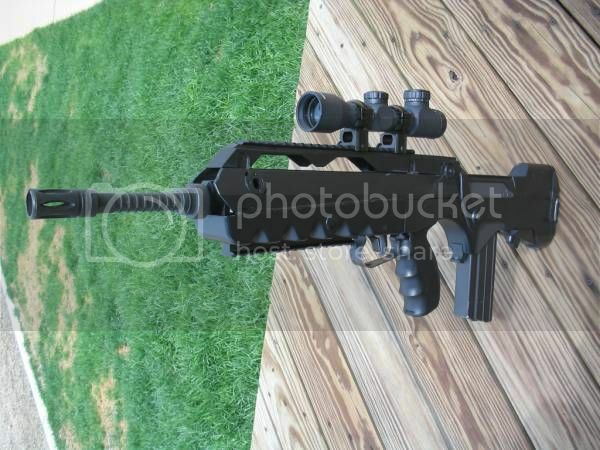 I have a few RIS rails and scope rails for a Famas F1 (the RIS rails don't fit on a SV). If you want a gun that will fire flawlessly at just under 300FPS for the maybe next decade, don't start faffing. If you want a gun that will fire at 350FPS for 4 games before breaking, faff away. Thanks all. I didnt have major planns as far as upgrading goes just wanted to push it that lil further and all my research and conformation from this forum a tight bore barrel an hopup seems best. I found an arftermarket rail for the sv but it all ways out of stock. I know faffing will mess things up 300 fps is great enough. Think im right in saying with that little push to 300 and tight bore barrel and hopup. Ill have better consistency and accuracy. Ill have better consistency and accuracy. Must be pretty bad if you're having these problems after just getting it. There is nothing wrong with it its great. I just need that little more for the site I play at. Are your issues present when firing on semi, or just on auto? A tightbore might get you more FPS, but its a little concerning that you want to 'upgrade' a new gun which by your own admission is presenting no abnormal behaviour. Its understandable to want an unusual gun though. i do understand its wired to want to upgrade a perfect gun. Some of my experience with building to building firing the bbs land just short of the building i thourt maybe little more fps and constatancy will improve that so i can provide better cover fire for team mates who are advancing to clear a building. Hope tha this make sence. TM guns have a decent hop-up already so he needs more power to get more range. One way to do this without adding more load to the motor would be improving the air seal so PTFE tape the inner barrel/bucking interface. Use a high quality tighter (but not silly tight) bore barrel (probs a 6.03mm Prommy rather than a 6.01) and then stabilize the inner barrel. A lot of sites are out of stock, but there is the G36 top rail mod which works well, if your willing to butcher it. Does look good if its done proper.